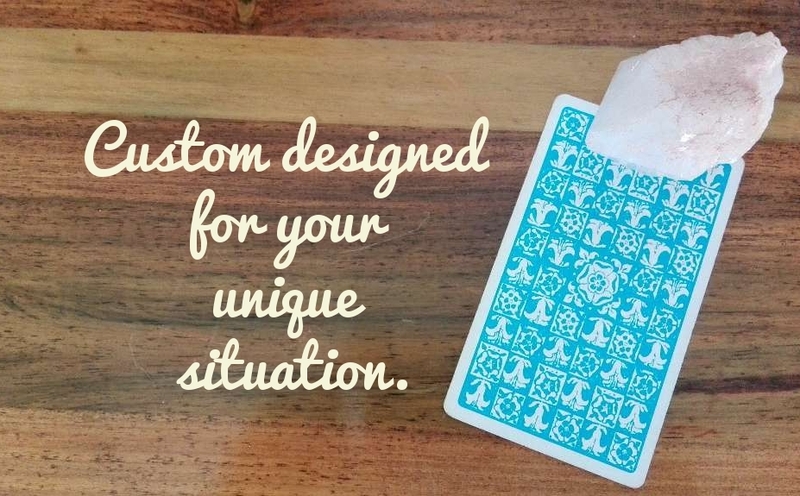 Based on your question(s), I design a tarot reading layout tailored to the specific insight you are seeking. I enjoy the process of carefully unpacking your questions for you to come away with the detailed, in-depth insight that you need. We unpack what is going on with you at the moment – and we weave different inquiries together for one comprehensive consultation. Sessions last 90 minutes. If you want to shift your perspective, have a higher vantage point from which to view your situation, come away with a strong understanding of the energies surrounding your circumstance, and rediscover your own inherent power to create enriching outcomes, then my approach will gel well with your needs. 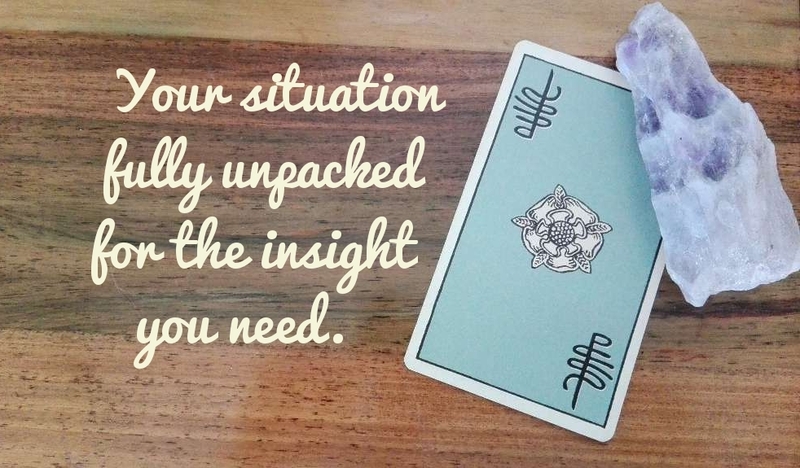 (Click here for the essential differences between traditional Tarot readings and intuitive counseling – the latter, of course, is my approach). Relationships – relationship-oriented consultations are intended to bring to your conscious awareness the underlying energetic dynamics within your relationship, and provide guidance for you to move forward. I will tailor the consultation to your specific needs, including such elements as: i) a purposeful assessment of your core relationship needs/style and how this is informing your current relationship experience, ii) a higher perspective: what each person is teaching the other, iii) the relationship’s current energetic status, as well as past influences iv) strengths and weaknesses of your relationship connection, v) the overall direction in which the relationship is headed, vi) what the relationship needs most to thrive. Change and transitions – Sometimes it can feel as though the rug has been pulled out from underneath our feet. We may more gracefully navigate challenging times of change and transition when we have a broader spiritual or soul context. Consultations addressing change and transition are designed to retrieve the healing bird’s eye view of your circumstance from your own higher mind and inner guidance. Life path, career and vocation – Get some perspective on career developments, how you are being asked to contribute your talents and skills to the world, and how you can blossom more into your talents, skills and service. What type of working environment best suits you? What do you need most in a career or job? How does your vocation relate to the soul impulses within you that are seeking expression? Choices and decision-making – Get the guidance and insight you need to make the most informed choices, and a higher perspective on the choices and decisions you need to make. Emotional healing, feeling stuck or stagnated, self-development, spiritual growth and the spiritual awakening process – we can address these in a consultation too. Click here for information on payment, delivery times, and reading length. We cover the same themes in the classic reading consultation (above), except we use your astrological birth chart, and prognostic astrological techniques (transits, progressions and solar arc directions) to provide even deeper therapeutic insight. You see, your astrological natal chart is a symbolic diagram of your own wiring and potentials. It outlines your essential energy attunement in symbolic form. If we are empowered with this information, we make choices and decisions that are in alignment with our natural energy flow. An objective statement of our wiring and energy attunement can also help us to validate what we know about ourselves, resulting in more self-love, self-acceptance, and faith in life. In addition to providing a snapshot of your wiring and energy attunement, astrology does one more thing which makes it a therapeutic tool that is unparalleled: it outlines your specific timetable of evolution and unfolding. Astrological counseling is uniquely and powerfully able to provide you with a CONTEXT for the challenges you are facing at the moment, and how you are being asked to develop and change. For example, periods of emotional crisis and catharsis can be better understood when you know that (transiting) Pluto is making a contact to the Moon in your birth chart. This period may bring up old resentments and emotional debris that you are being asked to release and may deeply transform your internal landscape. The action of Uranus on your birth planets can cue you in to your urge for change or disruption to your existing life patterns and structures, your urge for liberation from constraints, and your desire to do things innovatively and independently. 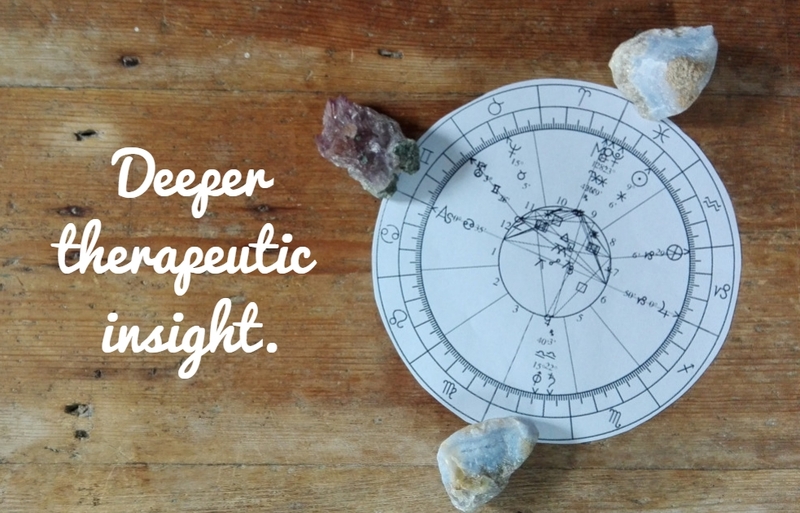 Appreciating that Neptune is making contact with specific planets and angles in your astrological chart can help you understand periods of uncertainty, and feeling like you are lost at sea, unable to take concrete, practical action. Saturn is a powerful symbol of the ways in which periods of adversity and constriction are demanding that you develop more maturity and responsibility – ultimately allowing you to meet life with more impeccability and a stronger sense of self. Astrology lets us know that there are certain times for certain things. During periods of Neptune’s activity, there’s often no point in forcing certainty when, according to the unique timetable of your evolution, you need to sit in uncertainty for a while so that latent talents, skills, and resources have the space to emerge. It’s this kind of thing that makes astrology an immensely powerful intuitive, therapeutic and counseling tool when used with sensitivity and know-how. My approach is not to provide an out of context “chart reading”, but to use astrology to help illuminate what is important for you right now. In this way, the symbols of the chart come alive for the most therapeutic insight and meaningful guidance. What we do in a session: we look at your birth chart to get clarity on your internal psychic blueprint, and how this blueprint is showing up in your life experience, goals and aspirations; we look at how configurations in your chart reflect internal BELIEFS (positive or negative); we examine your strengths, talents and individual path of mastery/growth; we look at what the chart suggests about resolving patterns that hold you back; we clarify what elements of your personality are in tension. We use the birth chart to illuminate the deeper factors at play in events/experiences in your life; we examine how your identity is shifting and evolving through time; we illuminate the meaning of periods in your life and the lessons inherent in them; we surrender to the grace and mystery of our experiences, recognizing that there is a cosmic logic to it all. We look at the blueprint of your life, as symbolized by the chart, in the context of the human collective group soul, and the evolutionary/karmic junctures we are at as a species as we resolve specific energies within the planetary body. Please also see here and here for more in-depth information on my approach to astrological counseling. You may also visit my YouTube channel for a variety of astrological content, and to help you become more familiar with me before session. (Please note that some of my astrological content is teaching content for astrology students, so do not be unduly fazed if there are technical terms there – we do not overemphasize technicalities in counseling sessions). I’ll ask you to fill out an in-take form outlining the specific issues you have going on right now, as well as your ACCURATE birth data. An accurate birth time is critical to casting a chart that is correct, and therefore able to give you the most relevant perspectives. An accurate birth time gives you a chart that is YOURS, not someone else’s. (Here’s an article on why an accurate birth time is so crucially important). Available only as Skype or Zoom sessions. Click here for more information on payment and how it works. If we have worked together before in an astrological counseling consultation, this is a combination follow up session. We’ll spend the first half of the session looking at astrological developments, and looking through an astrological lens to help bring perspective and support to where you are. The second of half of the session involves the use of the Tarot to help provide situational guidance, and to focalize the insights of the astrological component of the session. As usual, I will ask you to fill out an intake form with the specific issues you are facing at the moment, and the kind of perspective you need. Please also take a look at my Tools & Support Sessions to see whether this is the kind of follow up support you need. Of course, if you would like another astrological counseling consultation, where we spend the entire session in an in-depth astrological dialogue on topics of your choosing, please choose an astrological counseling reading consultation (above). Your knowledge of your child, combined with meaningful astrological guidance and perspective. The purpose of this consultation is to use the perspectives astrology can provide to help you bring more deliberateness and conscious awareness to your parenting style. –help you understand some of the deeper evolutionary and soul themes informing your relationship with your child. The contents of this consultation are meant to be resource and reference information/support for you, the parent. 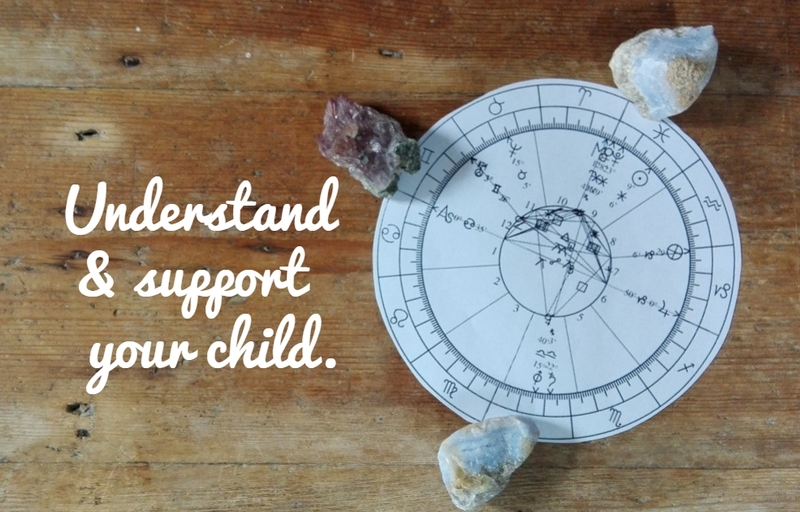 If your child is already getting counselling or therapy, the astrological perspectives here can help you to support your child within that process. I’ll ask you to fill out an intake form and outline your situation, your perceptions of your child, what you have noticed about him or her, as well as the specific challenges you may be facing in your relationship. On the form I will ask you for your child’s accurate time of birth, as well as your own accurate time of birth. Accurate birth times are critical to casting charts that are correct, and able to give you the most relevant perspectives. Here’s an article on why an accurate birth time is so important. This consultation is for parents with young children between the ages of 7 and 12, teens, and young adults up to the age of 22. One child per consultation. 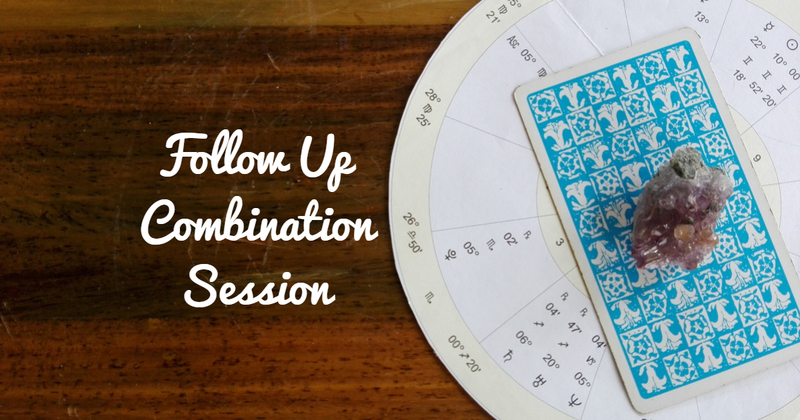 This session is personalized, tailored astrological instruction with your own chart as the lesson. Our own individual natal chart is often the first astrological map that we become familiar with, and is the ultimate teaching tool. The student of astrology begins by studying his or her own birth chart – which becomes a constant meditation and reflection throughout the committed student’s life. Your own birth chart as a teaching tool is unparalleled because you are at the front seat of your own life, and directly able to observe and reflect on your chart in action. In this session we examine the symbols in your chart as reflective of the themes, issues, beliefs and patterns in your current life experience. Duration: 2 hours. Within 24 hours of your purchase, I send you an intake form. On it, you provide me with your birth data, and you outline lifelong issues, challenges or habit patterns you have observed in your life. You may provide me with relevant information about dynamics within your childhood. You include your life narrative and the central issues, questions or focus areas that are important to you. I prepare your chart and any relevant notes ahead of session. When we meet, we discuss your chart in light of the issues and themes you have outlined, as we get to the heart of the astrological symbolism. Sessions are a teaching dialogue, and not a one-sided “chart reading.” You are expected to think reflectively and meaningfully about your own chart, and provide input. –Elemental emphases in your chart – looking at your fundamental baseline attunement in accordance with the four elements (basic, but overlooked and not appreciated for the interpretive richness this provides). – Sign emphases – examining the signs in your natal chart as core psychological motivations, needing fulfillment. Planets act to fulfill the underlying motivation of the signs they rule. -The core triad of your Sun/Moon and Ascendant – assessing how these are working together within your personality structure. -House placements and emphases. How to assess the planets in the houses of your natal chart. -Aspects – demonstrating my own method of drilling down to the aspects that are indicative of the most significant intra-psychic dynamics within you, and my specific 3-step method of assessing an aspect. -The Nodal Axis – assessing your core evolutionary aim or trajectory. 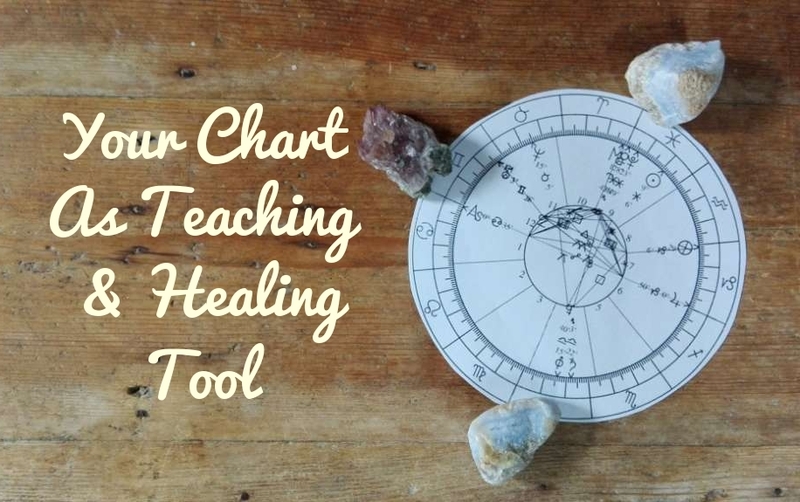 To leave you with a deeper, more holistic understanding of your chart. To leave you more astrologically fluent and refined in your use of the symbolic language. -The astrological system I am intimately familiar with is Tropical Astrology. As an intuitive, my technical understanding is informed by other intuitive data I may have access to, particularly as it relates to dynamics within the human collective consciousness and intelligence fields of the Earth – and how these intersect with the individual soul’s reasons for being here – to participate and contribute to the unfolding of the human collective/group soul. More on this here. -In working with natal charts, I use quadrant-based house systems: Placidus or Koch. My belief is that it doesn’t really matter which way you slice up the chart – the significant themes will make themselves apparent regardless of the system being used. No house system is “better” than the other (use what you are comfortable with and what works for you). Of far more importance is what the astrologer brings to the table. See my thoughts on house systems here. -In this session we are working ONLY with the natal chart. We do not look at transits, progressions or use prognostic techniques – I do this in the astrological counseling reading consultation. The astrological counseling consultation is better suited for you if you really want to understand the themes and lessons of where you are now, and where things are going (by transit, progression). While the astrological counseling consultation is itself an in-depth session (I can’t help myself: Sun/Mercury/Pluto conjunct in Scorpio), we do not unpack the birth chart to the same degree, and I am not focused on teaching. – I do not work with asteroids/planetoids, save for CHIRON, with which I am intimately familiar (and love exploring!). I prefer to teach only what I know, and simply do not have enough direct personal experience and observation in working with other asteroids. In working with natal charts, I focus on the essential psychic dynamics that are revealed by the planets, signs, houses and aspects, which when properly understood, provide a rich, inexhaustible source of data. -To familiarize yourself with me, you may find it useful to visit my YouTube channel. Click here for information on payment and guidelines for questions. I will be in contact with you to schedule session times. Leave no stone unturned with this package of three fully customized in-depth tarot reading consultations. I will work with you over the course of three sessions to help you retrieve the guidance you need. Rather than stuff everything into one single session, this package of three allows you to have the time to integrate messages, guidance and insights between sessions. A package of three allows you to cover a wider variety of issues, without feeling as though you need to rush through any one. Additionally, working over the course of three sessions has a cumulative effect – each session builds on the insights and processes of the first, helping you to anchor the information in a stronger way. Listening carefully to your concerns, I make notes during your first session, and these notes help me to design a framework for your subsequent sessions. Organize it how you want – you may explore three entirely different themes, or you may choose to explore different facets of a specific situation. (Use within 60 days). *** I will be in contact with you within 24 hours of your purchase. Look out for an email from me with an intake form. When checking out with PayPal please remember to leave a note which specifies the email address you would like me to use to communicate with you and to send your reading (especially if this email address is different from the one associated with your PayPal account!). The intake form will ask you a series of questions and to describe your situation with enough detail. While you do not need to write a whole lot, I am far more equipped to help you when you reasonably outline the context of your circumstance. In my experience, giving vague information does not typically encourage a nourishing reading for clients. Make your questions as specific as possible to retrieve the most focused information and insight. ***All payments in USD, secure payment via PayPal. ***If it is a recorded or written reading (only tarot-based consultations have the option of being recorded or written), it will be delivered within FIVE days of purchase. Please note this is EXCLUSIVE of the day on which you submitted the intake form. ***I will be in contact with you to arrange Skype/Zoom readings. Skype/Zoom sessions last about 90+ minutes. ***Skype/Zoom sessions are usually recorded, and the MP3 file made available for download. This is a service I happily provide, but please be mindful that anything can go wrong with the recording process, despite my use of two recorders. ***While written readings are generally at a minimum of 1000 words, I am far more focused on the QUALITY OF THE INSIGHT delivered to you, and the message which needs to be conveyed, rather than on a specific length. Thus, your reading could be 1000 words, or over 2000. For general information about my approach to intuitive reading counseling consultations and what to expect in a session with me, click here. Do also see my list of frequently asked questions about the process. For my Terms of Service, please click here.